The pattern I used was the felt tomato pattern from my personal pattern stash. 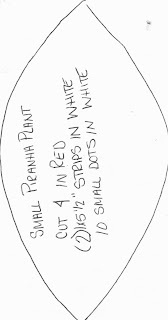 To make a tomato you would use 5 pieces of the pattern shown below, I used 4 and left one panel open for the mouth. 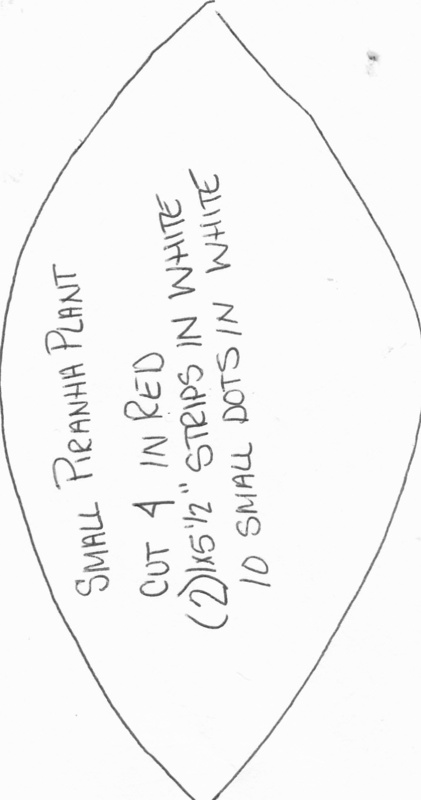 To make the larger plant I scanned this pattern into my computer and enlarged it so that it was 11" long, as big as I could make it on on piece of paper. So your felt pieces together. You will sew 4 pieces together, in the end you will have 2 flower heads, one for the outside and one for the lining. glue the cardboard to the inside out flower head. I used my tacky spray (because I love that stuff) and because it dries quickly, it is lightweight and it is flexible. 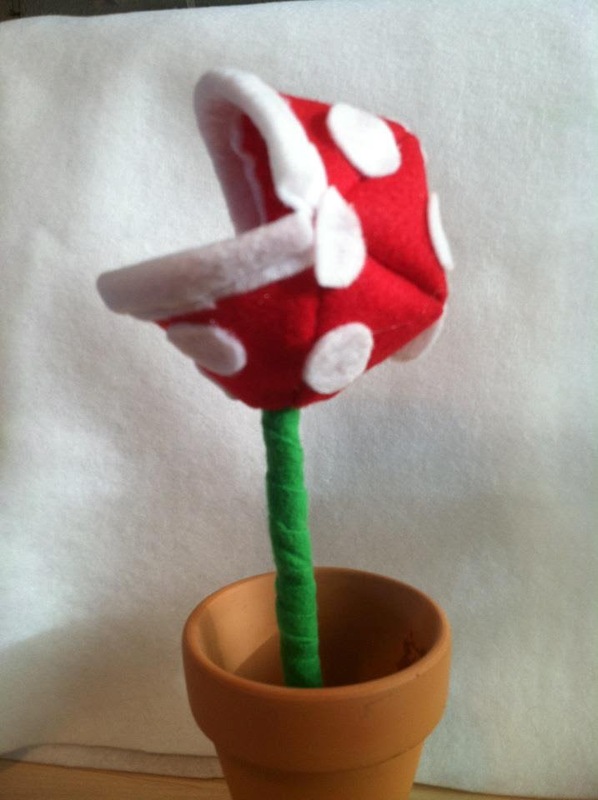 push the reinforced head into the inside of the first flower head. At this point I decided to go paint my pot. Terricota pots look a lot like the warp tubes in Super Mario, just the wrong color. I turned it upside down and sprayed it. Back inside, heat up the good old glue gun. Cut a strip of white felt approx 2" wide. Hot glue to secure all the way around. I cut mine in 2 different pieces and matched them up in the corners of the mouth. went to check on my pot. I learned that tericotta does not like to be spray painted. The paint just ran right off the pot. I sprayed a second coat and let it dry longer, but if I were to do it again I would purchase acrylic paint and hand paint the pot with my sponge brush. back inside again. cut a long strip of the green felt approx 1" wide. wrap it around a long dowel, securing it with hot glue after ever couple of wraps around. stick the dowel into a piece of foam. I pulled this from an old project from last summer (hence the holes) If your pot is dry stick the foam in the pot. I used my spray adhesive to spray the bottom of the pot before I put the foam in, that way it won't wabble around. If you are using a square foam like I did you might need to use some of the cardboard scrap to wedge in the bottom of the pot.....becaues I tried to stick a square peg in a round hole....I needed a little extra reinforcement. Punch a hole into the bottom of the plant. I used my trusty screwdriver. Hot glue all over the dowel end to fix it to the inside of the flower (I used a lot to do it) then take a bit of red scrap and hot glue it over the dowel end. And there you have it! 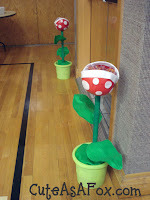 A Giant Piranha Plant from Super Mario Bros! Perfect to hold the fire balls for the Goomba Knock Out Game! That is the coolest thing ever! did your husband love it!? There are other characters too on the game like his brother Luigi, the enemy Browser, Boo Diddly etc.